A new wave of high tech punk is sweeping the UK punk-goth-industrial scenes, promoted by labels like Wasp Factory Recordings and Oktober Productions. Soldering irons, laptops, big digital noise and politics driven by DIY attitude. Calm Productions presents five bands that represent the new mood, from the breaks n' bile of Deathboy, experimental anger from History of Guns and Snuff Radio, and in-yer-face industrial politics from Action Directe, to transhuman apocalypse chic from Xykogen. Anarchy. Electronica. 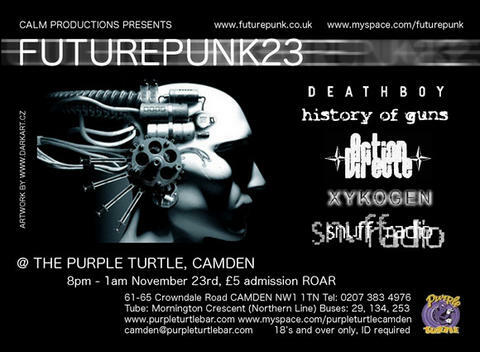 Camden Purple Turtle, 8pm-1am Thursday November 23rd, £5 ROAR.